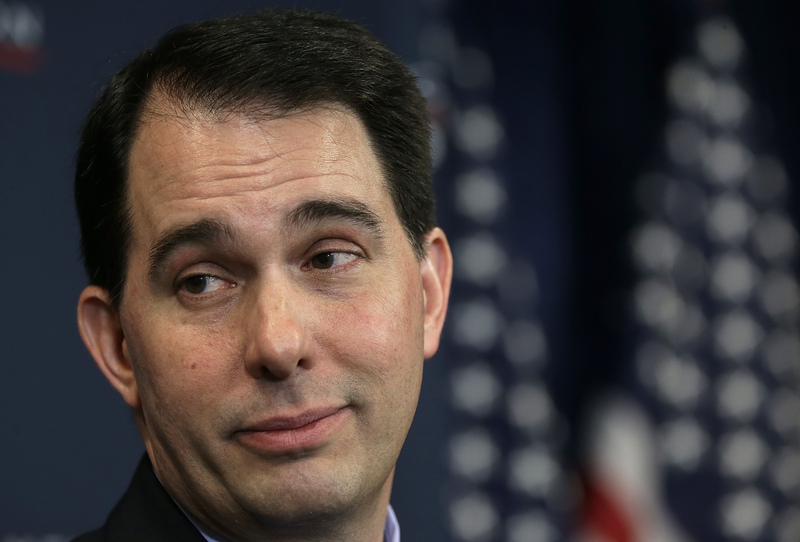 Will Scott Walker fare better in London than Chris Christie did? Wisconsin Gov. Scott Walker heads to London Monday for a four-day trade mission, and he's got to be hoping that his trip goes better than the one fellow Republican Gov. Chris Christie took last week. Christie's three-day trip abroad went awry after the second day, when he fielded a question about the United States measles outbreak and said that parents should have "some measure of choice" in whether to vaccinate their children. The outcome: his staff struggled to reassure the press that yes, Christie does believe children should be vaccinated, a contentious interaction with a reporter in which the governor refused to answer other foreign policy questions, and scores of headlines declaring the trip a train wreck and a disaster. Walker can only hope to avoid a similarly unscripted moment that detracts from coverage of his efforts to woo international business to Wisconsin or, frankly, any negative headlines at all. But for many politicians eyeing a White House bid, a trip abroad to be seen chatting up high-ranking foreign officials and brushing up on foreign policy is an opportunity they must seek out. The handful of current and Republican former governors who could launch White House bids have filled seat after seat on London-bound flights to deter potential criticism that they are too poorly versed on foreign policy to run the country at a time when half the world seems consumed by crises. And that criticism is sure to come from within the Republican field given the sheer number of people considering a run. Take Sen. Marco Rubio, R-Florida, who said at a Christian Science Monitor breakfast last month, "The next president of the United States needs to be someone that has a clear view of what's happening in the world, a clear strategic vision of America's role in it and a clear practical plan for how to engage America in global affairs. And I think, for governors, that's going to be a challenge, at least initially, because they don't deal with foreign policy on a daily basis." It's likely fear of hearing those very words in a debate that has driven so many current and former governors to Great Britain. Louisiana Gov. Bobby Jindal went last month during a 10-day trade mission throughout Europe to deliver a speech at the conservative Henry Jackson society there. Rick Perry went in October while he was still governor of Texas and spoke at the Royal United Services Institute. Former Gov. Mike Huckabee toured Parliamanent, Westminster Abby and the Churchill War Rooms and delivered speeches. Have Iowa conservatives found a new star for 2016? "Governors running for president need to show they have developed some foreign policy expertise since their jobs keep them at home most of the time. Voters know governors understand domestic issues, but half a president's job is coping with the complexities of global crises," Larry Sabato, the director of the Center for Politics at the University of Virginia, told CBS News. "Candidates can't be caught flat-footed on the trail and in debates when international topics are raised. Getting briefed by experts is one thing, seeing leaders abroad is quite another--and then the candidates can sprinkle their comments with first-hand experiences." Trips to London haven't been limited to governors, either. Rubio delivered his own foreign policy speech there in November at the Chatham House think tank, and former Secretary of State Hillary Clinton, who has flown all over the world, visited in July as part of the tour for her book, "Hard Choices." Sabato said that the United Kingdom is one of the two favorite foreign destinations for candidates - the other being Israel - behind immediate neighbors Canada and Mexico. "Britain is historically one of our closest allies, and once you're in New York, it's just a five-hour hop across the Atlantic," he said. "There's no language barrier, either." Yet in spite of the seeming low levels of risk - no cultural or language differences or complex relationship to navigate - politicians still have a knack for garnering unflattering headlines in London. Look no further than 2012 GOP nominee Mitt Romney's trip to London in the summer of 2012. There were a handful of gaffes during the trip, including a blind quote from an adviser who accused President Obama of not understanding the "Anglo-Saxon heritage" the U.S. and Europe share, seeming to forget the name of Labour Party leader Ed Miliband and accidentally revealing a secret meeting with Britain's MI6 intelligence agency. But Romney's time in London is perhaps best remembered for an interview he gave to NBC in which he said there were "disconcerting" signs in the preparations 2012 Olympics. That resulted in British Prime Minister David Cameron and London Mayor Boris Johnson taking some thinly-veiled shots at Romney over the comments, including suggesting that Romney had an easier time overseeing the 2002 Olympics in Salt Lake City because they were in "the middle of nowhere." The rest of his trip, which included a stop in Poland, was far from a success. Christie, like Romney, learned the hard way that the press exposure on a foreign trip cuts both ways. Jindal's headlines came from his planned speech, in which he said that Muslim immigrants have created "no-go zones" in parts of Europe where they rule by Sharia law rather than the laws of the country in which they live. A day before the speech, the city of Paris announced it would sue Fox News after the network aired similar remarks from an on-air commentator, though Jindal did not back down from the claims. So when Walker - who is the GOP's rising star at the moment - lands in London tomorrow, he'll have to weigh the experiences of his predecessors and ask himself this: Are negative headlines really better than no headlines at all? For the time being, he is playing it safe: the majority of the trip will take place behind closed doors and his staff is stressing the fact that it's a business trip, not a photo op. But he has at least one event open to the media: a speech entitled, "Building Global Partnerships for Stronger Local Economies" at the Chatham House on Wednesday.